I live in a large for NYC, one bedroom apartment in which my living room and bedroom is a shared space. My teenage son has the bedroom. Although I have the closet space in that room. Anyway, one of my biggest challenges is always where to store my makeup collection, and how to organize my stash in the small space. I’ve finally figured out the perfect set up. 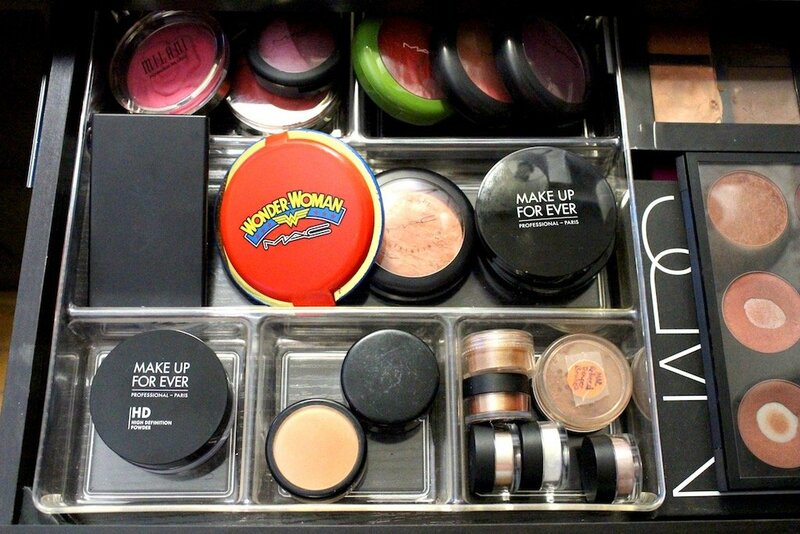 So I decided to share with you guys to help you organize your makeup if you have a small space as well. I used to store my makeup in the bathroom but outgrew that space. Which was good since storing makeup in the bathroom isn’t a good idea with the humidity. Then I decided to set up my beauty corner. But my beauty corner used to be a shared workstation with a desktop computer. There wasn’t enough room on the desktop for makeup storage. 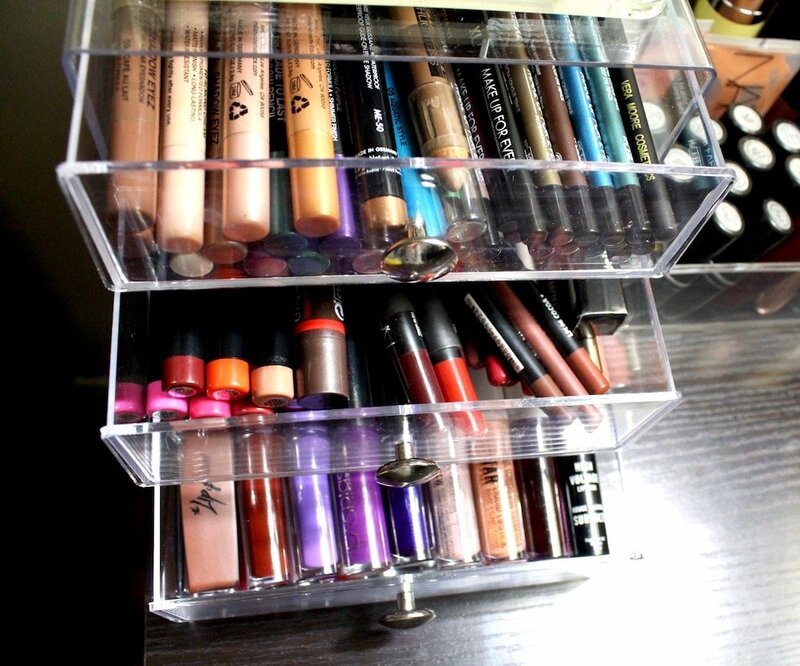 So I used to store all of my makeup in an Ikea Helmer. The thing is, it became super annoying having to go through all of those drawers to find what I needed. Once I traded in my desktop for a MacBook I was able to do two things. One, store more makeup on top of my desk, in sight. And two, get a new desk with lots of drawer storage. Here is my current set up. 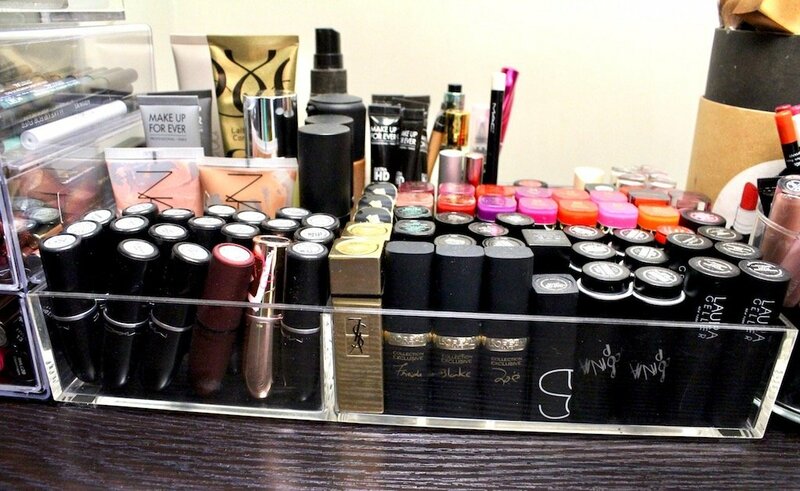 Let’s start with how I organize my makeup on top of the desk. First of all, I got this desk on sale from Target for less than 100 bucks. It doesn’t take up a lot of space. 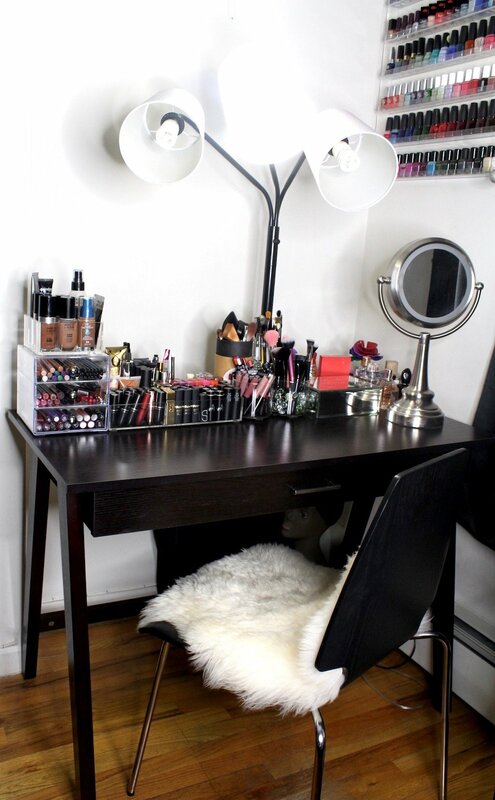 But has lots of room for makeup storage and organization on the desktop, and in the drawer. 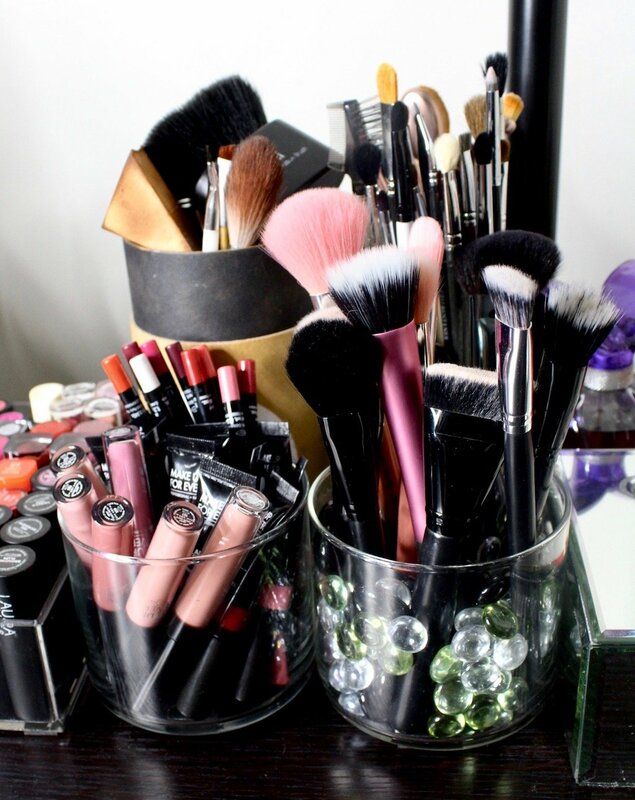 I use a combination of acrylic trays, acrylic drawers and glass jars which makes it super easy to organize your makeup. 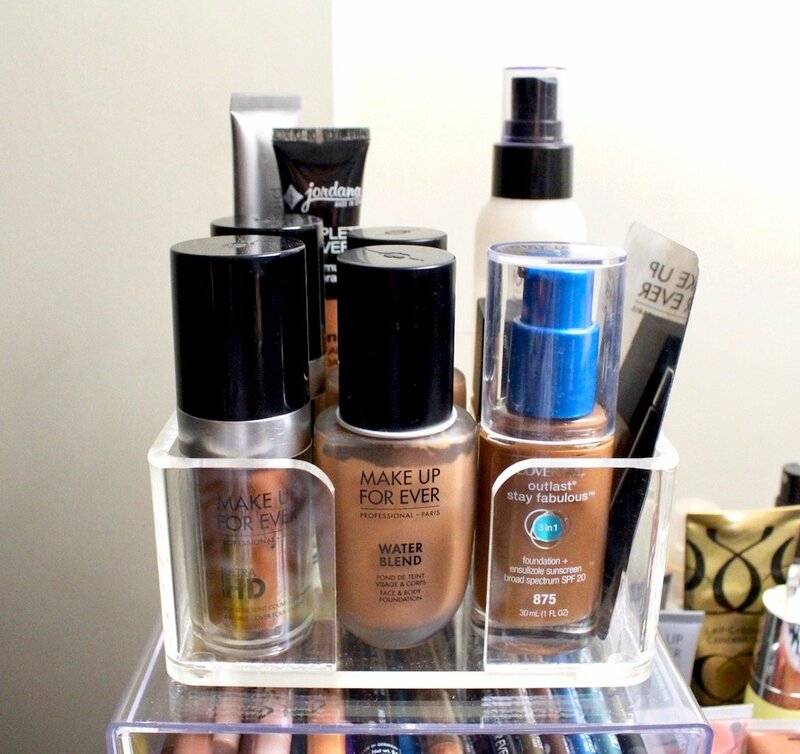 I store my foundations in an acrylic tray on top of a small set of three acrylic drawers. The foundation tray is actually an acrylic napkin holder. Sometimes you have to think outside of the box. 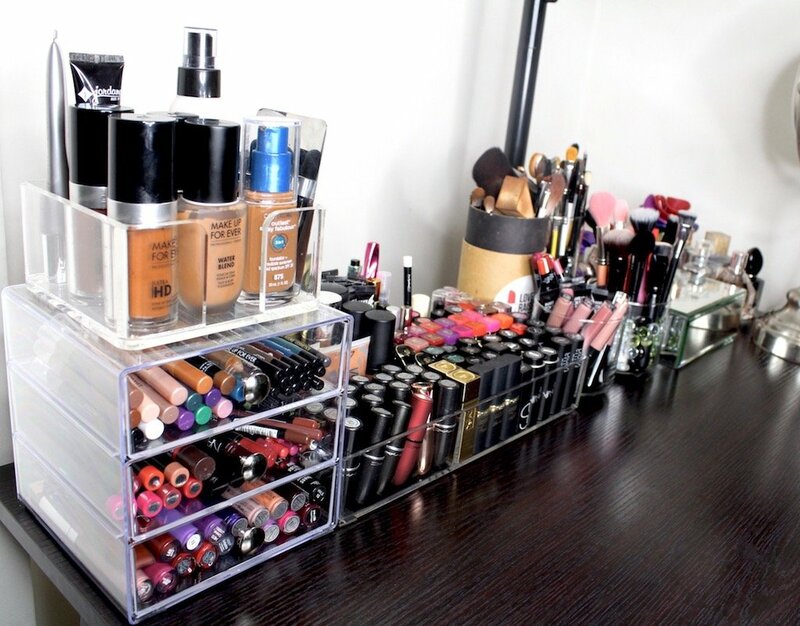 This acrylic three drawer makeup storage organizer holds a lot. In the top drawer I have eyeshadow and eyeliner pencils. In the middle drawer lip crayons and lip pencils. And in the bottom drawer, liquid lipsticks and lip glosses. This 8-section acrylic tray holds a ton! 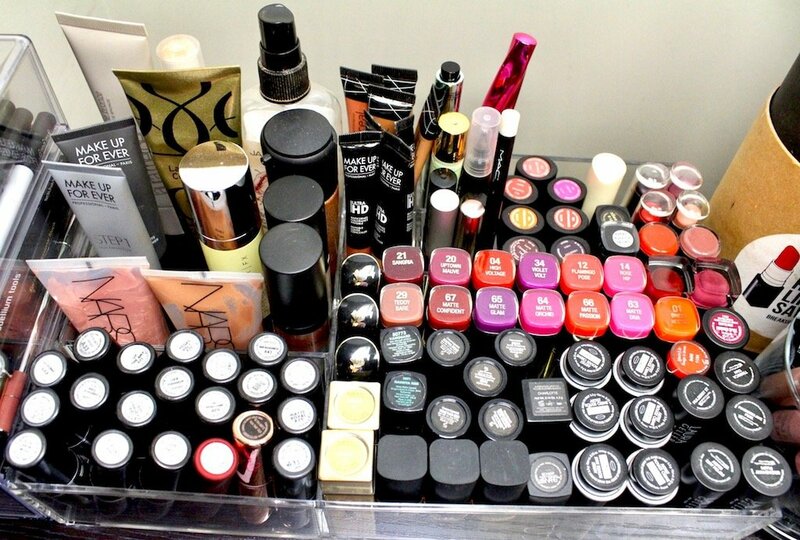 Lipsticks take up the majority of the space, stored by brand, and then color. Primers, liquid illuminators, concealers and products like mascara and brow pencils take up the rest of the space. Glass candle jars with marbles hold makeup brushes. While a cardboard canister holds dirty brushes until wash day. The jar on the front left currently holds new lip products that I’m still testing out. After I’m finished testing, I will store liquid lipsticks in this jar, and lip glosses in the bottom acrylic drawer. A mirrored jewelry box holds miscellaneous items like q-tips, tweezers, perfume samples, hand creams and extra lashes. 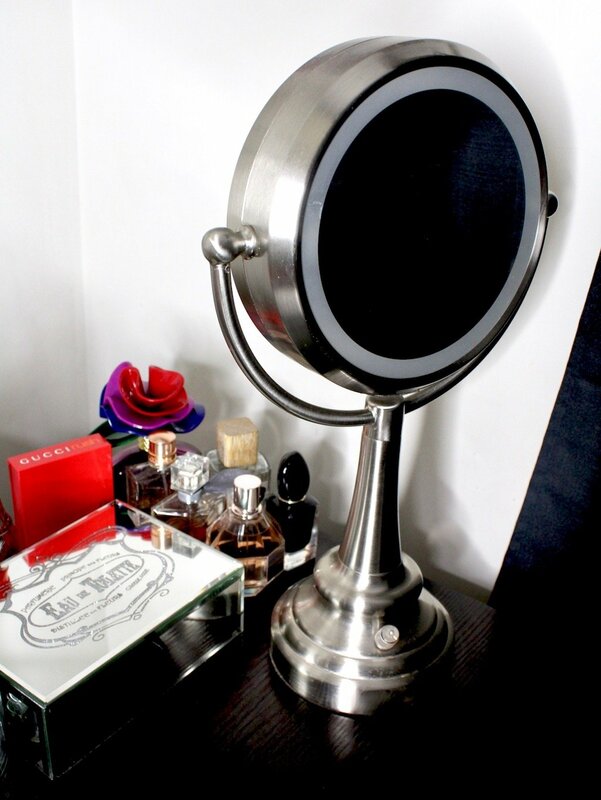 I use a lighted magnifying mirror to do my makeup, which I store to the side of my desk when not in use. This lamp with daylight bulbs gives perfect lighting for applying my makeup. 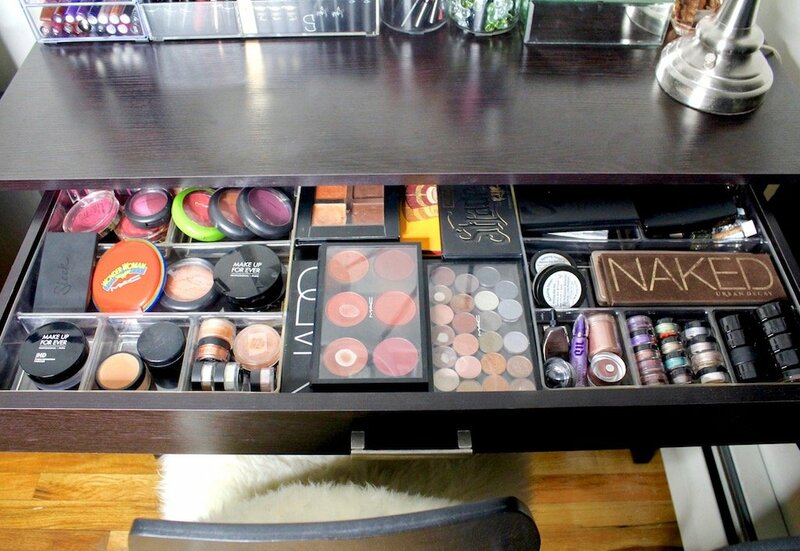 Now I’ll show you guys how to organize your makeup in a desk/vanity drawer. My desk drawer is long but pretty shallow. 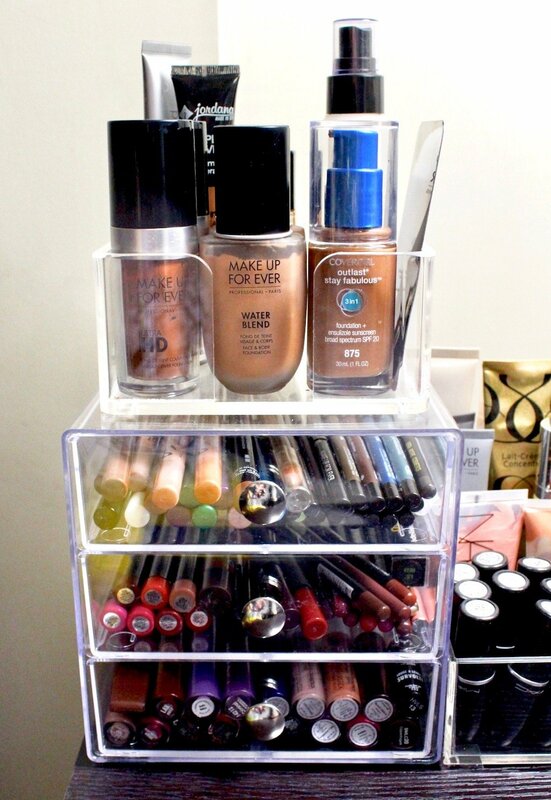 However, it’s the perfect height for makeup storage. 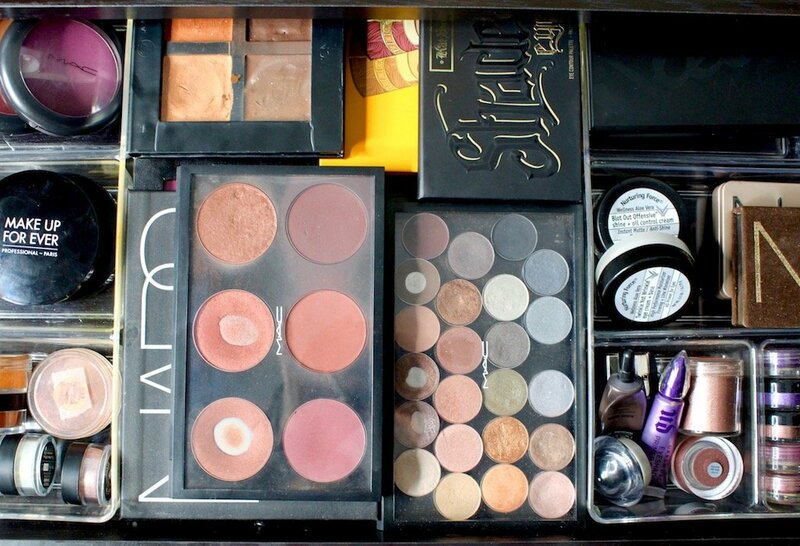 I use two 6-section drawer organizers to store most of my makeup. I store palettes in between the organizers since there’s excess space. The left organizer stores single blushes, highlighters, bronzers, and setting powders. My palettes fit perfectly in the middle of the organizers. I depotted most of my blushes and eyeshadows and store them in palettes, consequently they take up less space. The other organizer holds brow gel, primers, eyeliner, single eyeshadows, pigments, my NAKED palettes, lashes, glitter and smaller palettes. I store extra brushes and lashes in baskets, in the space behind the organizers. And that’s it for the drawer. 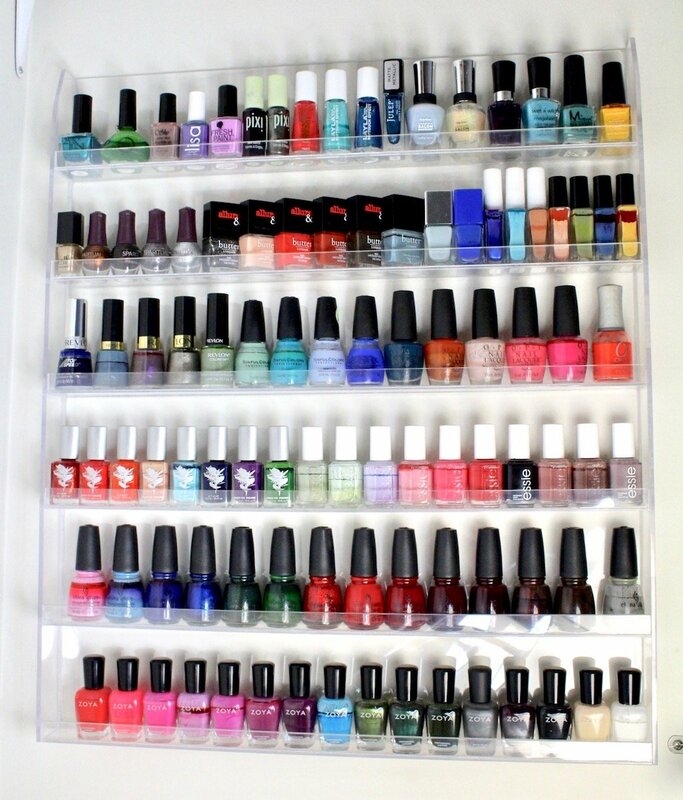 I store my nail polish in this wall storage rack. It’s all filled up at the moment. 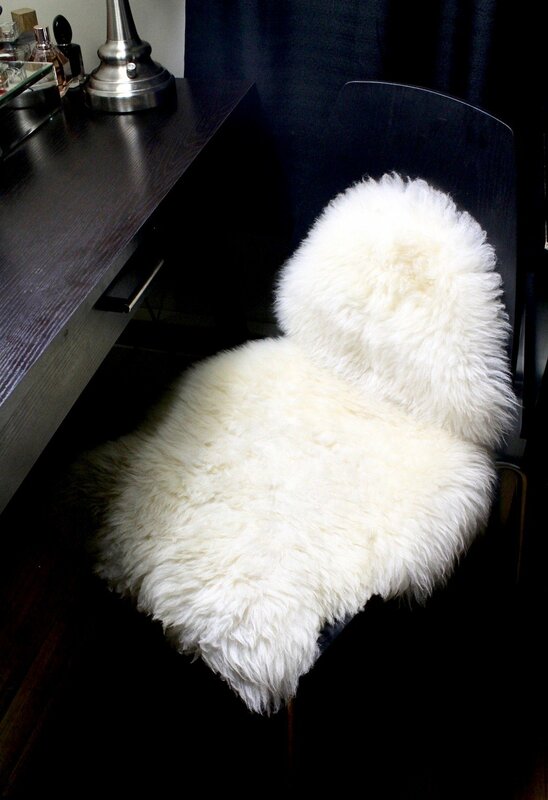 An Ikea Rens Sheepskin Rug keeps my vanity chair comfy. You can try this rug if you don’t have an Ikea near you. The Ikea Tejn is a faux fur option. Most of my space is used up and I don’t really have room for growth. This is a good thing for me though. It forces me to constantly go through my collection and get rid of what I’m not using. I receive new products for review on the regular, so it’s easy for my collection to double or triple in a short amount of time. I put the products that I know I’m not going to use to the side for my mom and sisters after review, and take it to them when I go visit. My friends also grab what they want from the giveaway stash when they come over. This is how I’m able to easily maintain my beauty corner. 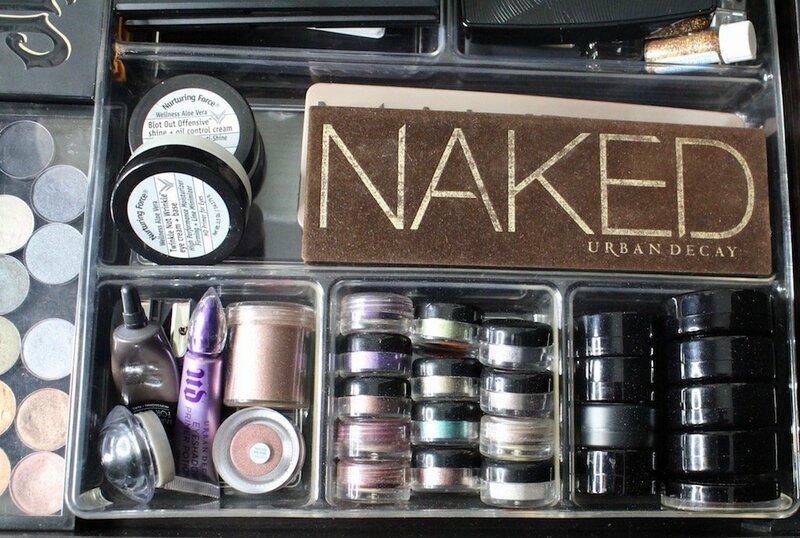 Feel free to leave tips on how you organize your makeup in the comments! Vey nice and detailed post! I’m also short on space. You have given me some ideas to work with! Thank you so much. Glad I could help! I need to set up something like this since I have a small space as well. Thanks for the inspo!!! I think this was helpful in that; the average woman doesn’t have massive collections and therefore can relate to this post. Nice job!